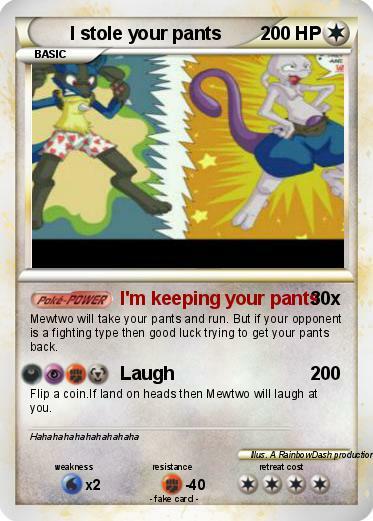 Mewtwo will take your pants and run. But if your opponent is a fighting type then good luck trying to get your pants back. Flip a coin.If land on heads then Mewtwo will laugh at you. Waluigi pants | pants kaiser | wheres my pants guy | Fancy Pants | Where are my pants? | Where's my pants | Where are my pants | Pants | Penguin pants | Pants guy | pants bob | Ants in my Pants?! | STEVE | cate | ripped pants | Baby Einstien | Snoopy Pants | patrick | I STOLE THIS NAME! | Awesome Dog | STEVE and cate | HEROBRINE | : 3 | D.W | Gollum | Menelaus | Misty | Jason | asdfmovie | Family | Micaela my love | bad cat | Pikachu Stole Your Hat | I stole your Pikachu! | TOOTHLESS | Tigerstar | foxy | BOSS ex | Derp | HOMELESS CHRIS | OHHHHHHH | Plankton | Crazy Ash | money shark | Dad 10000000000000000 | Mega Squirrel | you stole my chair!!!!! | Octoprime | i stole your jeans | Joshua | Squirrel | Dr. Phil | Sonic and Caliburn | Marisa | Kung fu Ash 2 | keith sejr | Ash Stole Meh Burger! | Stole smasher | Timmy | Pika robber | Cute Kitty Stole Bed | doopliss 9999999999 | its not delivery | charlie and "friends" lv.X | Yogi Bear | I stole my moms phone | Pants on that ground! | fancy pants | Pikachu want ketchup!!!!! | Pikachu stole my soda!